After Joanna explained these categories we were to reflect on where we saw ourselves. We then walked the labyrinth here at Grace House. What struck me most was the possibility that I might be at various locations on the continuum depending upon the particular social justice matter. For example, I sit on the Diocese of Newark’s Namaste Commission where we conduct dialogues for racial reconciliation and healing. 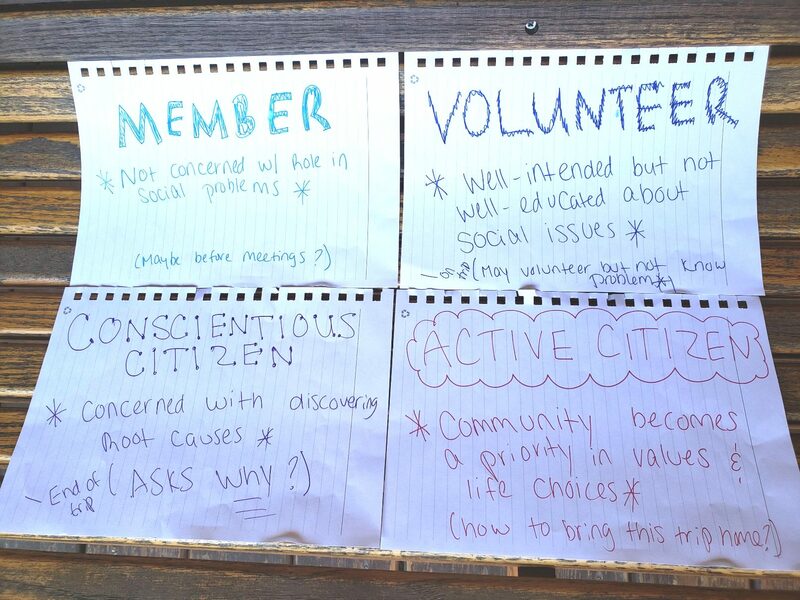 In that role, I have moved from volunteer to conscientious citizen in the few years being involved with the group. My hope is that as I look to educate myself further, I will become an active citizen and do some work to banish racism while ensuring we never forget the mistakes of our past. In the opening of our Food Pantry, the Church of the Holy Spirit displayed itself as a conscientious citizen in doing much research about the working poor. The goal of our pantry was/is to service shoppers who are unable to pay their bills, provide for their families and have healthy food on their table. In addition, our congregation works toward being active citizens by serving at Christine’s Kitchen in West Orange twice a year, and other outreach programs like Heifer International. My hope is that we as a congregation will continue to work as active citizens, and do some work to obliterate the root cause of poverty (issues with minimum wage, fair distribution of wealth, etc.) and make a change in our community. During my time on our mission trip, I have experienced each of us move from being just volunteers and/or conscientious citizens to living as passionate active citizens. The time together has allowed many of us to see the level of privilege we each have, and so the question for each of us is: When we return to Verona, will we remain in an active citizen role, or return to our lives with less of a focus on caring for the needs of others? Only each of us as individuals can answer this for ourselves. My hope and prayer is that our time in western Virginia will have a lasting impact on how we live our daily lives. May it be so!